Are you tired of not being able to remove the hooks from the fish's throat, grip lines, cut lines, split ring, crimp lead, crimp sleeves or even open a beer can or bottle? I'm sure you are! In 2018 all the fishermen will wish to have this Fishing Pliers Multi-Tool in their fishing trips. Our tool is made from solid high-quality stainless steel. Jaws' multi-functions include most user needs in your fishing trips. Besides these, the handler contains a lot of tools which you will frequently use in outdoor. You will benefit from a knife, cross-shaped screwdriver, flat screwdriver, saw, hook sharpener, can opener, bottle opener, drilling tool. The ergonomic handles and design offers to you the possibility of easy practice and does not drop it from your hands because of slippery. The coiled lanyard assures you will permanently have the tool linked to your belt and avoid losing it. The sheath is made of a synthetic material, black color, which fastens on your belt. The sheath closes with a velcro fastener. We included a black piece of hydrophilic textile to help you dry up the pliers after use, avoiding corrosion and rust. Please clean the fishing tool with light oil when you're back from the fishing trip! 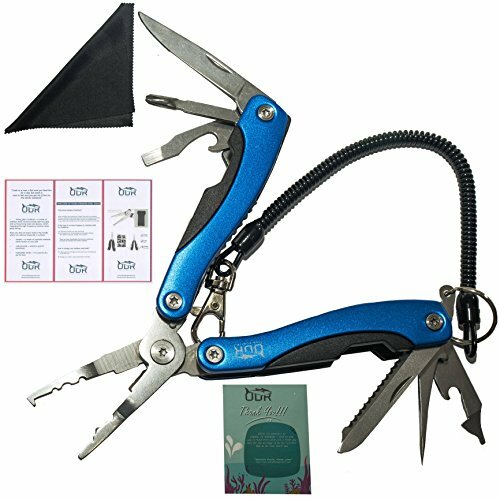 Inside the package, you will find a leaflet which presents the fishing pliers multi-tool, purpose, component parts, rules for cleaning. Also, we attached a Thank You Card to express our gratitude for being our customer. So act right now, today you are the number one fisherman with best fishing tool ever! EASY HANDLING AND CLEANING: The comfortable handles and ingenious design makes a good practice even for those with a weaker grip or small/big hands. Whats more, cleaning up is super simple too. Just dry it up using the hydrophilic textile and clean it with light oil when back from the fishing trip. If you follow the maintenance rules, you can use the fishing pliers with lanyard even in saltwater. If you have any questions about this product by Outdoor Runs, contact us by completing and submitting the form below. If you are looking for a specif part number, please include it with your message.